Good morning to DD fans far and wide! 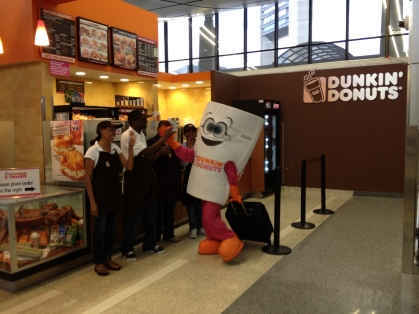 My name is Dunkin’ Cuppy, and I have one of the world’s best gigs as the official mascot for Dunkin’ Donuts. 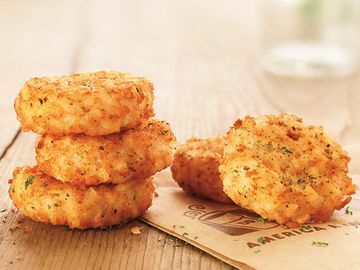 If you are an avid DD lover, perhaps we have exchanged a high-five, a warm embrace, or a free donut at a DD sampling event! Even if we have not met before, I am sure that we could become fast frienDDs. Today I have exciting news to share about my latest adventure to California—check it out! Hanging out in the JetBlue terminal at Logan Airport in Boston, MA with some of my favorite DD crew members! 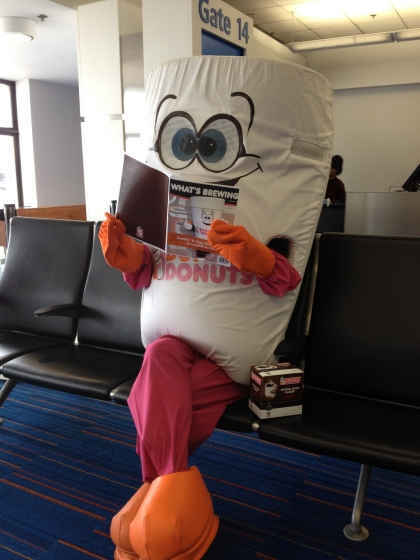 Last month, I had just returned from signing autographs at a DD restaurant opening when my agent informed me that Dunkin’ K-Cup packs were coming to participating Baskin-Robbins locations in California! The arrival of Dunkin’ K-Cup packs marks an important moment in DD history: for the first time ever, California residents can purchase and enjoy Dunkin’ K-Cup packs in their very own state. All they need is a Keurig® Home Brewing System to brew a delicious cup! 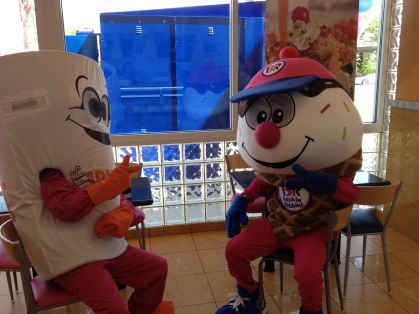 Since Dunkin’ K-Cup packs will be sold exclusively at participating Baskin-Robbins shops in California, I instantly called Coney, one of my old college pals who happens to be the official mascot for Baskin-Robbins. Like any kinDD-hearted ice cream cone, Coney is always looking for reasons to celebrate. He invited me to visit California for a V.I.P. 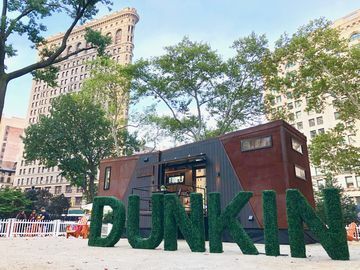 Dunkin’ K-Cup launch party! 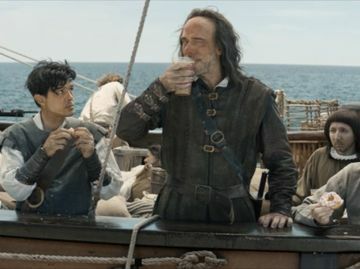 As if I wasn’t already overjoyeDD, he then bestowed me with the honor of delivering the first-ever Dunkin’ K-Cup packs to one of his favorite Baskin-Robbins shops. Coney and I sharing a laugh! Although I consider myself to be a worldly cup of Joe, I had never before traveled to the West Coast. My excitement began to percolate as I planned all of the details of my trip. My friends at JetBlue hooked me up with round-trip tickets to Long Beach, CA, a town in the heart of Baskin-Robbins country. Naturally, flying on JetBlue is my all-time favorite way to travel! DDid I mention Dunkin’ Donuts is the official coffee of JetBlue Airways and they serve Dunkin’ Donuts coffee on board every flight!? When the day of my star-stuDDed adventure finally arrived, I stuffed my roomiest suitcase with Dunkin’ K-Cup packs and frolicked into Logan Airport in Boston, MA. I couldn’t contain my happiness as I took pictures with smiling Boston fans, caught up on some pleasure reading in the waiting area, and chatted with the JetBlue folks at the ticket counter. I always love to catch up on the latest news. Once I hopped aboard my flight, the flight attendant made sure that the K-Cup packs were tucked in safely—after all, they are very precious cargo. Then it was time for liftoff! 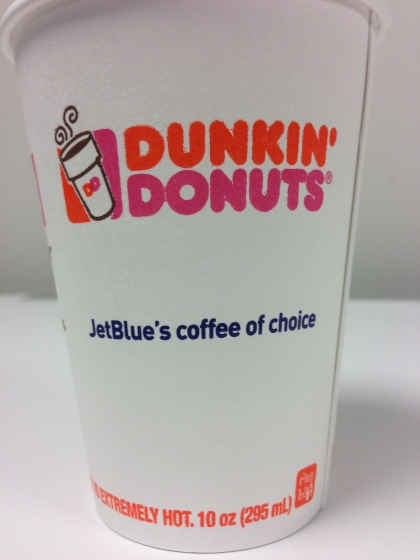 I enjoyed my share of freshly brewed Dunkin' Donuts Coffee aboard my JetBlue flight! Our flight landed in Long Beach just in time for the party. Coney’s chauffeur arrived in a convertible to drive me to the Baskin-Robbins shop, so I cruised down the Los Angeles freeway in style! Little did I know, this was only the beginning of the rock star treatment. Our convertible rolled up to the Baskin-Robbins shop where I was greeted by cheering fans, colorful balloons, paparazzi, and—best of all—my dear friend Coney! 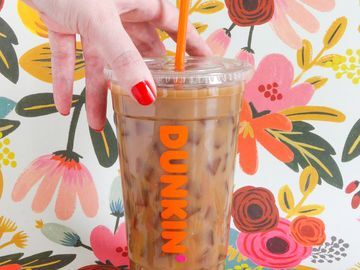 Welcome to California, Dunkin' K-Cup packs! The crowd went wilDD as the Baskin-Robbins crew rolled out the pink carpet (the same color as the famous Baskin-Robbins pink spoon). I had an amazing day delivering the Dunkin' K-Cup packs and spreaDDing Dunkin’ Donuts joy to a whole new group of fans. Coney made sure that I traveled in style! 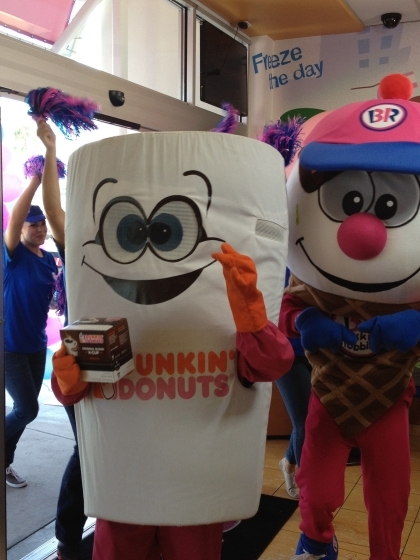 Do you feel like you missed out on the Dunkin' K-Cup pack launch party action? Check out this footage to take an up-close-and-personal look at my journey of a lifetime! I deDDicate this video to Coney, the BR crew, and my frienDDs at JetBlue! Thanks again to all of my friends at JetBlue for taking such great care of me as I brought the very first Dunkin’ K-Cup packs to California!